A really long review, I warn you. It's been two weeks since I saw it (who releases a film called The Glums in JANUARY? 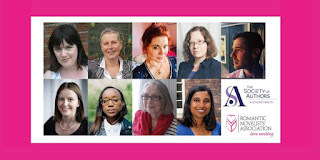 Sure...no one needs cheering up this time of year) and I've been meaning to put down a few thoughts about it, when I've assembled them correctly. (and yes, there was another reason for the pause. It's taken me a while to be able to assemble coherent thoughts after my beloved cat Jack died, very suddenly and wholly unexpectedly, on 20th January. I don't know whether grief really is all the worse when it comes suddenly, but it sure as hell feels like it). Anyway, to the barricades! Well, eventually to the barricades, because one of the distinctive features of Les Mis is that holy crap, is it long. 158 minutes long, which is 2hrs and 38 of our Earth minutes. And considering that it's a totally sung-through musical, with barely a few words of dialogue, that feels a little too long. Yes, I know the stage production is similarly lengthy, but this isn't a stage production. Things work differently on screen. There's no interval for one thing (more on which later). I'd have made some cuts, especially at the beginning when there's rather a lot of Valjean staggering around looking bedraggled and singing introspectively about his fate. Chop chop! 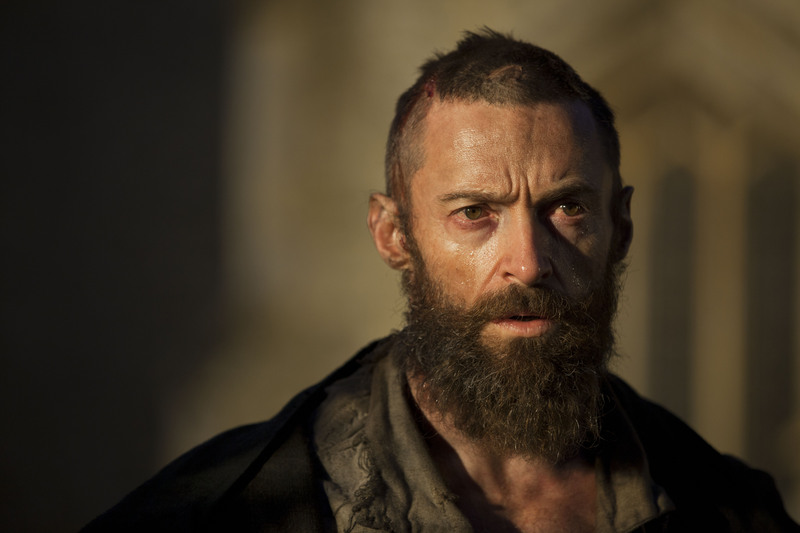 Speaking of Valjean, I heard Tom Hooper say that their wishlist went: "1: Hugh Jackman. 2: Please refer to number 1." It's a big, big role, not just because of its popularity but also because it fills such a huge portion of the screen time. Valjean ages over 16 years, going from convict to respectable businessman to soldier to old man. It's a lot to take on. Generally, I think ol' Huge does a pretty good job, but I do wish he'd stop doing that vibrato thing with his voice. I'm not quite sure he deserves his Oscar nod, though. ...which is precisely where she winds up. Desperate for money to keep her illegitimate child, Cosette, safe, Fantine sells her hair, her teeth, and finally her body. We see a grimy, unwashed sailor take her to his cabin and heave about on her for a few minutes, before chucking some coins at her and wandering off. Fantine sits up in the nasty little bed and sings I Dreamed A Dream, with the camera tight on her face. It's difficult to watch. She doesn't spare any of the ugliness of her situation. But, okay. I watched some cast interviews and they all said how Tom Hooper got right in their faces as they auditioned, because that was where the camera was going to be. Which works for I Dreamed A Dream, because it's precisely right for Fantine's terrible situation. She has nowhere to hide and neither do we. However, he pulls the same trick on another couple of solos, and it loses its charm. Here's why, with two examples. 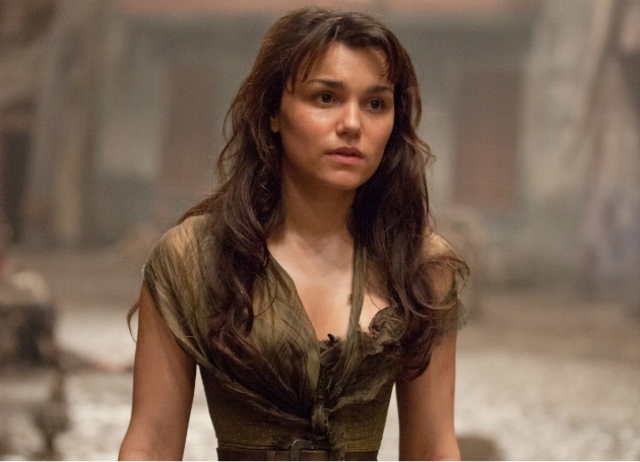 And yet what do we see while Eponine is pouring out her heart? Do we see the lights misty in their river? The trees full of starlight? Do we even see a river or any trees? No, we see some wet cobbles (which don't shine like silver), and then the camera gets right up close in Eponine's face and, oh look, nowhere to hide again. I want to see her fantasy world, or at least a glimpse of it. I want to see how much bleaker the real world is. I want to see those streets full of strangers. But she really is on her own. ...I'd kind of like to have seen some evidence of these ghosts, please. If I recall correctly, at this point in the stage production we actually see the ghostly figures of his friends appearing around the edges of the stage, and of course on screen you can do a lot more than that. No, we don't need cheesy Jacob Marley-style hauntings, but I wanted to see a tiny glimpse, out of the corner of my eye, of Enjolras or Gavroche; the flicker of a shadow; the echo of a song. You know what it's like when you've lost someone. You keep thinking you've seen them, and then you remind yourself that you couldn't have. So many times in the last two weeks I've heard a cat meow, or seen a tail flick around a doorway, and thought, "Oh, is that Jack?" Of course it's not. And the reminder that it can't be, will never again be, is dreadfully painful. Empty Chairs is all about that hollow little gap where someone should be, and isn't. Redmayne does a great job, but he's singing, "My friends, my friends, please forgive me!" to ghosts who aren't there. Who patently is there, solidly and relentlessly, all the way through, is Inspector Javert. Russell Crowe has had a bit of flack for his portrayal, but I reckon he did a good job. He's an interesting villain, because he's not actually a bad person. Javert is a policeman in the same way that a tree is wood. It runs all the way through him. He believes in the law, and will pursue the law singlemindedly. The law has saved him from a pitiful beginning--born in a prison with 'scum' like Valjean. Javert sees the world in black and white, and when he's faced with Valjean, who's been lightening his shade of grey for decades, he simply can't compute. Valjean protests that all he did was steal a loaf of bread because his family was starving. Javert replies, "You will starve again, unless you learn the meaning of the law...Yes, 24601." "My name is Jean Valjean," spits Valjean, incensed. To which Javert replies, implacably, "And I am Javert. Do not forget my name; do not forget me," and adds, pointedly, "24601." And from this pillar of the law, I'll move on to the antithesis, which is the villainous Thenardiers. They run an inn, and apparently take care of little Cosette (remember her? Good), while in reality using her as unpaid labour and extorting ever more money out of poor Fantine. Sacha Baron-Cohen and Helena Bonham-Carter, who clearly had the time of their lives when they did Sweeney Todd, are just as clearly relishing these roles. Master of the House is one of the times when the film style works better than the stage show, because it can move that much faster and contain that much more detail. The befuddled, whirling customers, unaware they've not just had their pockets picked but their glasses have gone too; his 'band of soaks, my den of dissolutes, my dirty jokes, my always-pissed-as-newts,' who are dribbling and covered in vomit; the pair of them charging a bridal couple 'two percent for looking in the mirror twice', and a second later 'three percent for sleeping with the window shut.' Thenardier lamenting the loss of his dear 'Colette' who clearly can't wait to get away (a just-the-right-side-of winsome Isabelle Allen). Top stuff. Leavens the misery nicely. 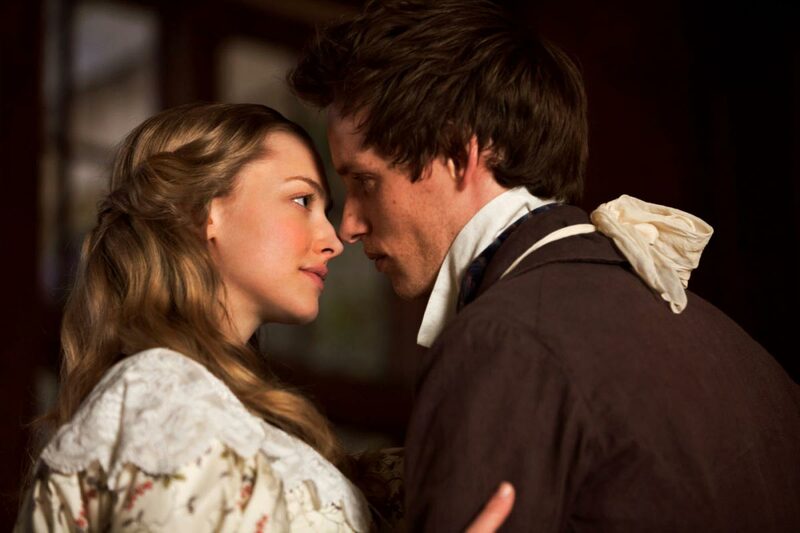 I think that only leaves Cosette, who is played as an adult by Amanda Seyfried. Now, I've always thought Cosette was a bit of a thankless role, just a lot of mooning around and warbling in a voice so high only dogs can hear it, but Seyfried manages to pull off a not-quite-so-irritating performance, on which she should be congratulated. The otherwise nausea-inducing A Heart Full of Love is redeemed by some nice cinematography (check out those butterflies!) and when Marius introduces himself and stammers, "Cosette...I don't know what to say!" her sweetly embarrassed shrug is nicely judged. All in all...well, you've probably got to love the musical before you can love the film. Some of its problems are inherent, such as the odd jarring moment at the end of the spectacular, rousing One Day More which ends Act One: in the theatre, you clap and clap and then you get up and queue for the loo or go to get your interval drinks. In the cinema, you just sit there wishing those giggly teenage girls behind you would shut the hell up, and wait for the next number to begin. The pacing can be a little slow--what's measured and thoughtful in the theatre can drag in the cinema--and as I said, I think there could have been more scope in a couple of numbers--and a lot less HERE IS MY FACE SINGING cinematography. That said, the big crowd scenes are spectacular, and there are some nice touches, like the death pose of Enjolras mirroring the way he falls backwards over the barricades on the stage. But, as my friend Alysia said when we left the cinema, "I know there's a clue in the title, but my God that was depressing." I don't really think Les Mis is for me..hell, I cried at The Hobbit...so thank you for the opportunity to feel as though I've seen it without having to go through the agony and the numb bum and the HUGE quantity of popcorn it would take. Good review, Kate. I was so embarrassed at having to stare up the actors' nostrils that I closed my eyes during the solos. But I'm glad I saw it.